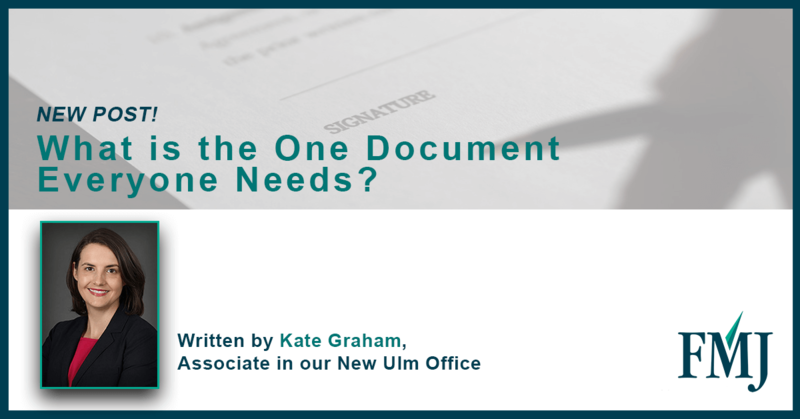 What’s The One Document Everyone Needs? We are often asked what are the essential legal documents that everyone needs. While it’s true that most people need to put an estate plan in writing and most will need to decide between a will or a trust plan, there is really only one document that everyone needs, and it’s not a will or a trust. It’s a health care directive. If you are reading this and you don’t have a health care directive, get one. Anyone over the age of 18 needs a health care directive. Why? While a health care directive can do a number of important things, the most important thing it does is nominate someone else to make health care decisions for you if you cannot. If a serious illness or accident happens and you become brain dead but remain on life support, do you have someone with the legal authority to make the decision to remove life support? Or if you have a terminal condition, is there someone who can decide for you whether to pursue treatment or palliative-only care? As some people like to say, who can “pull the plug” without having to go to court to get a court order to do it? If you don’t have a health care directive, then the answer is, no one. You might think that, if you’re married, your spouse can make these decisions. But, there is no law in Minnesota that makes your spouse the default decision-maker for your healthcare decisions. If you want your spouse to be able to make those decisions without question, then you need to have a health care directive. You might also think that, if you’re a young person, your parents can make health care decisions for you. Again, not necessarily. For people over 18, your parents no longer have the legal authority to make healthcare decisions for you. So again, if you want your parents to have this ability, you need to sign a health care directive. If you have a child who just turned 18, I strongly recommend you have them sign a health care directive in case something were to happen to them. In addition to nominating someone to make health care decisions for you, a health care directive can also state your wishes regarding organ donation and final disposition of your remains. There are many different forms available for health care directives, and some are quite short while others go into great detail regarding your wishes for your health care (a popular one is called the “Five Wishes”). Most physicians and clinics can also provide you with a health care directive form. You can choose any form you like, but it must have the following components to be valid in Minnesota: It must be dated and signed by you, it must nominate at least one person to act as your health care agent, and it must be either witnessed by two people or notarized. If you use witnesses, at least one cannot be a healthcare provider, and none can be your agent (or agents). Also, keep in mind that your spouse or close family member cannot notarize your documents based on legislation passed last year. This post was written by Kate Graham of FMJ’s Agriculture practice group. If you have questions about health care directives or elder law, she can be reached at kate.graham@fmjlaw.com. Power of the Big. Spirit of the Small. Fafinski Mark & Johnson (FMJ) is a full-service commercial law firm that practices differently. Since our inception in 1999, we’ve had one primary goal to provide big-firm knowledge and expertise, but in a more intimate, small-firm customer service model – that means more attentive service at a lower cost. IRS Confirms No Clawback for Lifetime Exemption Gifts Help for Farmers Facing Flood Damage and Financial Stress Aircraft Succession Issues My Spouse Needs Nursing Home Care – What Do We Do?